The official Element 14 7 inch touchscreen is fully supported by the Portsdown 2019 software, although tt does not currently work properly for FreqShow mode, and no Composite Video output is available from the RPi while using this display. However, it is significantly faster and being a full HD display does look stunning! We would recommend anybody building a new system to use this display. 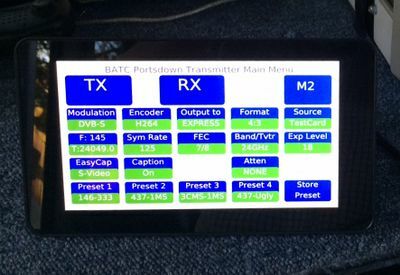 The Portsdown transmitter is also designed to be used with the Waveshare 3.5 inch Type A touchscreen which connects to the RPi using the GPIO connector. Do not use any display which connects through HDMI. The HDMI output is disabled by default in the Portsdown software for 2 reasons: firstly, the HDMI output uses one of the clocks which is used by the DATV coding software and interferes with its operation; secondly, the Composite Video output is enabled for use with analog video transmitters, and use of this output disables the HDMI port. The Waveshare 4 inch display can be used, but new features do not always work with it, as modifications to the standard build are required to be tested and implemented by small group of users before being incorporated in the standard build. To use this display, select Waveshare4 in the display selection menu in the console. After new features have been added in an update (for example FreqShow in release 201801012) it may be necessary for existing Waveshare 4 users to select a normal Waveshare display in the console, and then reselect Waveshare 4 to load the required settings. The Waveshare 3.5 inch Type B can be made to work by selecting WaveshareB in the display selection menu in the console. It is not recommended as a display, because it is not included in any pre-release testing. The PAL Composite video output on the RPi is active (except when the 7 inch screen is used) and in some modes displays the same image as is displayed on the touchscreen, although there is no touchscreen control. Its primary purpose in this application is to be used as a signal source for Analogue ATV transmitters. The image and touch maps of the 7 inch screen may need to be inverted (for example if you have used one of the older screen mounting boxes). The Portsdown 2019 software has a function to reverse the display in the "System Config" menu accessed through Menu 3. This page was last modified on 5 February 2019, at 15:00.